Anti-Arthritis, Anti-Inflammation Cookbook: Healing through Natural Foods by Gary Null, Ph.D. 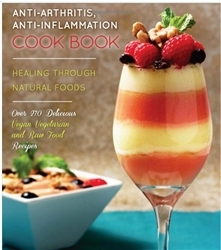 This New York Times best-selling author brings you more than 270 anti-arthritis, anti-inflammation recipes to heal conditions and diseases of inflammation, which are largely perpetuated by the high-fat, high-sugar, chemically laden Standard American Diet (S.A.D.). If you, like millions of others, are determined to feel better, and to prevent and reverse diseases like arthritis, cancer, diabetes and heart disease, devour the contents of this book and make its delicious offerings the mainstay of a new eating program...your health and life depend on it.